Little Riley Kovalcik’s cute letter to Seattle Seahawks running back Derrick Coleman went viral after her dad tweeted a picture of the note to the football pro, the Daily Mail reports. In her letter, Riley calls Coleman her inspiration, telling the star that she knows how he feels. You see, Riley and her identical twin, Erin, are hearing-impaired and were really moved when they saw the legally deaf football player featured in a Duracell ad, talking about how he took control of his struggles. The girls were so touched by the commercial that on Sunday they were glued to the TV, cheering Coleman on as his team beat the San Francisco 49ers and made it into the Super Bowl. His success gave Riley the idea to try to get in touch with the running back. "I also have hearing aids. Just try your best," the 9-year-old wrote. "I have faif in you Derrick good job on January 20th game. Go Seattle Seahawks!" 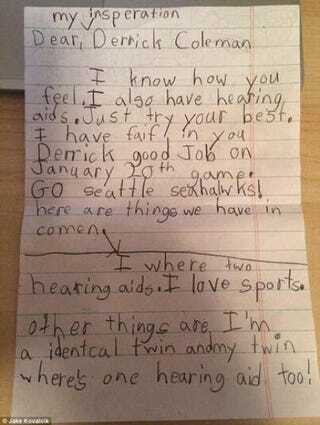 Her dad then took the letter and tweeted it out to Coleman and the Seahawks, and from there it blew up. "He inspired my daughters, but it's a great thing he's doing, not just for hearing-impaired kids or kids with other disabilities. He's showing all kids that if you work hard and you dedicate yourself, whatever deficiencies you have, you can be great. I wanted to thank him," the twin’s dad said. Coleman has stolen the nation's heart for the incredibly moving "Trust Your Power" ad he did for the battery company. The video has more than 9 million hits on YouTube.